STREAT – 66 Cromwell Street, Collingwood, 5 McKillop Street, Melbourne, and ground floor of Melbourne Central next to the escalators to the trains. The e-version of Melbourne for Conscious Foodies is now available on iTunes, Amazon, Angus & Robertson, Barnes & Noble, Booktopia, Kobo and more. See the full list of e-retailers HERE. WHAT IS THE MELBOURNE FOR CONSCIOUS FOODIES FOOD GUIDE? The focus of our guide is to help city dwellers and travellers seek out eateries around Melbourne that are conscious to their very core. Some of the eateries featured include: Auction Rooms, Rudimentary, Streat, Tamil Feasts and so many more! Not to mention, tips, and places to volunteer and give back to in Melbourne’s food community. 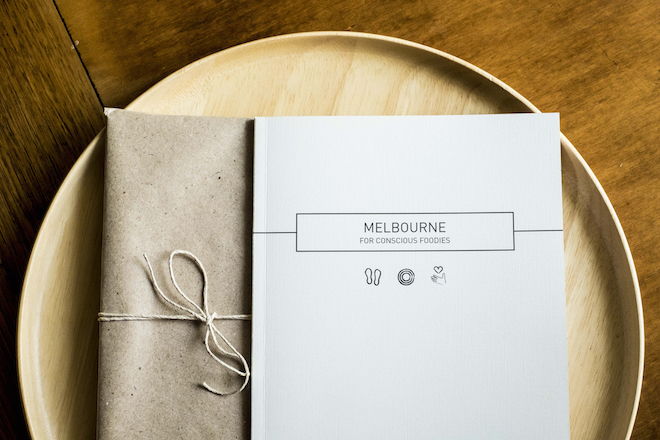 The slim 36 page guide has a minimal, black & white aesthetic and has been printed locally in Melbourne with vegetable-based inks and on paper using sustainable pulp resources, our printer also has FSC certification. contributing to the greater community or those less fortunate. The real essence of the guide is ‘giving back’, and with that in mind we will be donating 25% of the profits from each guide sold to a local Melbourne initiative/cause. I will be reporting on that contribution each quarter. The Melbourne for Conscious Foodies food guide is available for purchase now at $9.95 via our online shop (AUS only) or directly through me at info@decisivecravings.com.au for purchases outside of Australia. To launch the Melbourne for Conscious Foodies food guide we have also run a very limited number of stunning Conscious tote bags in two colours: white and oatmeal (sold out). They have been designed, printed and sewn right here in Melbourne and are $55 each. They are made with 55% Belgian Cotton and 45% Linen. The sizing is 45cm (H) x 40cm (W). 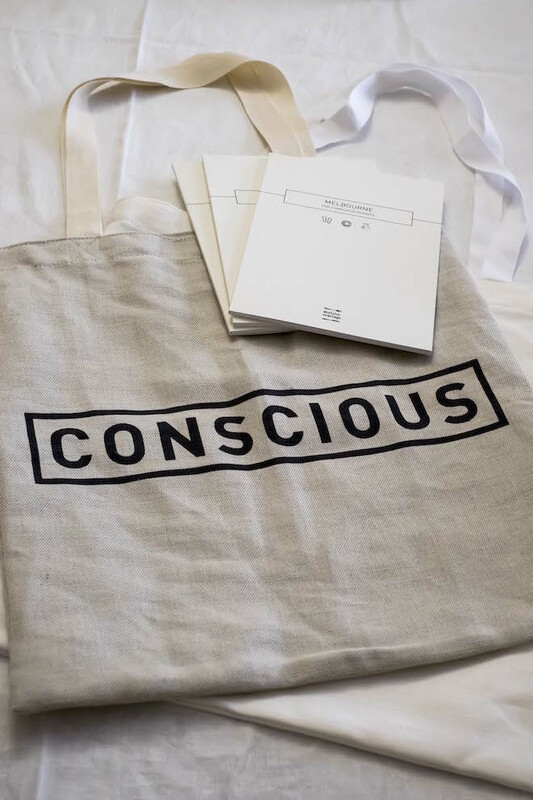 25% of the profits from each Conscious tote bag sold will be donated to a local Melbourne initiative/cause. You can purchase the Melbourne for Conscious Foodies food guide at our online shop HERE (Australia only). For purchases outside Australia, please email me at info@decisivecravings.com.au. Thank you so much for your support guys and stay tuned for more updates. Also, I must mention a very special thanks to all my dear friends and family who contributed directly and indirectly to the creation of this guide with their thoughts and feedback. Most importantly a huge thanks goes to our incredibly talented graphic designer and my personal friend Lauren Seeman. You can see more of her work here.